We are pleased to introduce a guest post by Dr Jennifer Howes, an art historian specializing in South Asia and author of The Courts of Pre-Colonial South India. In the Royal Asiatic Society’s library, there are 55 drawings that were used to illustrate the first ever attempt to interpret Sanskrit vastu shastra texts into English. 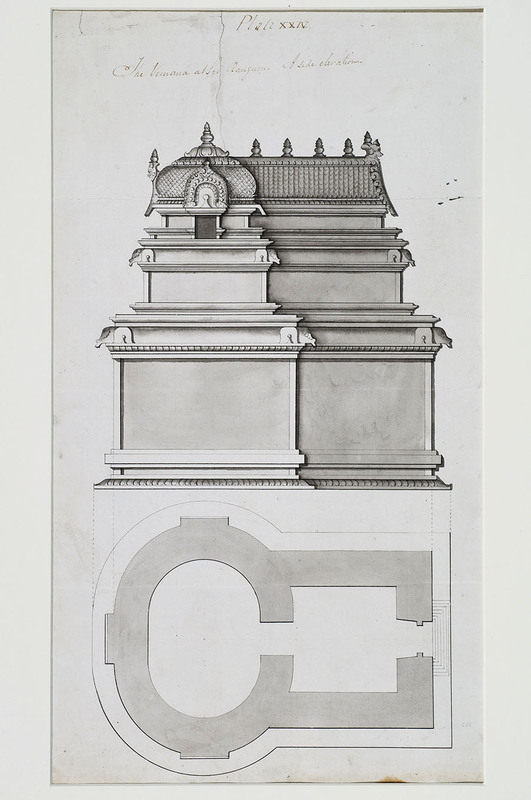 Catalogued as the Ram Raz Collection, the drawings are named after the author of “An Essay on the Architecture of the Hindus”, published by the Royal Asiatic Society in 1834. Its content drew upon two vastu shastra texts titled the Manasara and the Mayamata. This pioneering work shows the admiration that the Royal Asiatic Society held for Indian civilization. 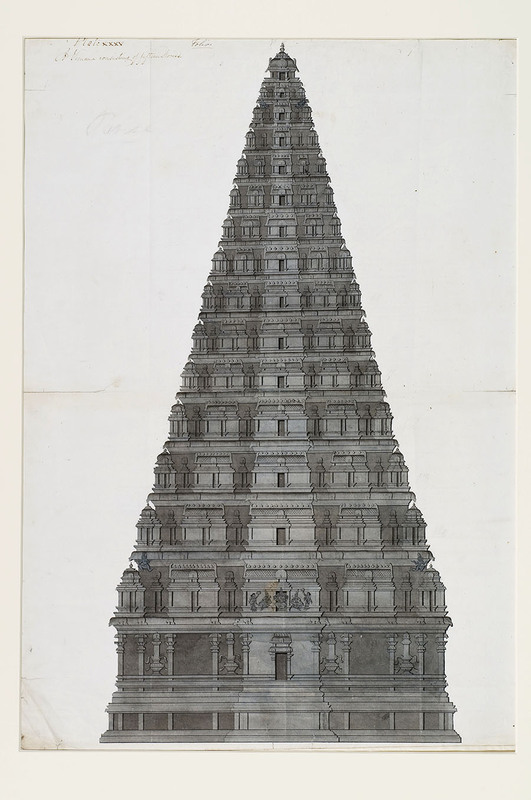 RAS 034.036 – A sixteen storey vimana. As its title suggests, Ram Raz’s “Essay” interpreted vastu shastra texts as architectural treatises. However, it is unclear whether Ram Raz genuinely believed in this interpretation. It seems more likely that the Royal Asiatic Society instructed him to give vastu shastra an architectural reading. 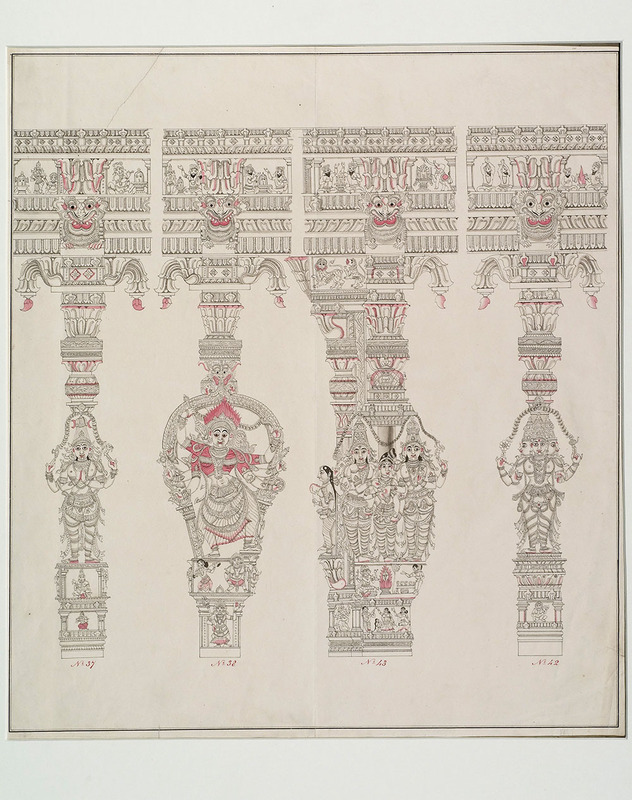 The 55 drawings that illustrated Ram Raz’s “Essay” mainly show south Indian temple components, but these drawings do not represent the true content of the Manasara and Mayamata. RAS 034.017 – Three columns from the temple at Tiruvannamalai. Vastu shastra texts describe buildings, but their broader focus is the social rank of human beings, as described by their material circumstances. Buildings only form one part of these descriptions. Other items described in the Manasara and the Mayamata include chariots and the royal paraphernalia of kings, such as thrones and crowns. There is even a chapter in the Manasara on the construction of parrot cages. The Manasara also categorizes nine different classes of kings according to the sizes of their entourages. The smallest of these nine kings, the astra graha, was said to have 500 court ladies in his entourage, while the highest ranking king, the Chakravartin, allegedly had 10,000,000,000,000,000,000 court ladies under his control. This second number exponentially exceeds today’s world population, so based on this hyperbolic description of the Chakravartin’s entourage, it is fair to say that vastu shastra texts should not be interpreted literally. Their fantastical contents have inspired contemporary architects, but it is totally misleading to regard vastu shastra as pre-colonial texts on architecture. The true meaning of vastu shastra is to idealise and classify society through possessions. 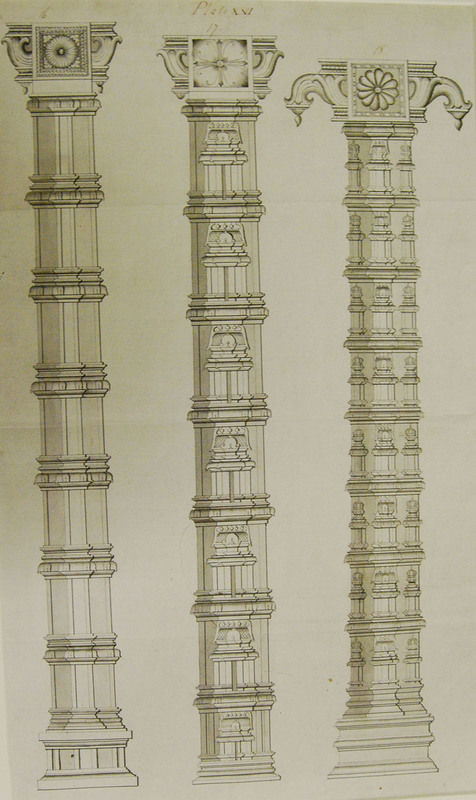 RAS 034.073 – Columns in the Pudu Mandapam, Madurai. The Ram Raz Collection holds a further 23 sheets of drawings that were not published in his “Essay”. These show the sculpted pillars inside of the Pudu Mandapam at Madurai. Nearly all of these show columns sculpted with human figures. Some even show kings with their entourages (RAS 034.068). Unfortunately, Ram Raz died in 1830, so we will never know whether he intended to author a second essay, illustrated with these other drawings. Was it possible that Ram Raz planned to write about the broader meaning of vastu shastra? Dr. Jennifer Howes – South Asia Specialist, Art Historian. London: Oxford University Press, 1927-1934. “Tirumala Nayaka’s ‘New Hall’ and the European Study of the South Indian Temple.” Journal of the Royal Asiatic Society Volume 11, Issue 2, pp.191-217. “The Manasara and Pre-Colonial Kingship in South India”. Chapter 1 in Howes, J. The Courts of Pre-Colonial South India: Material Culture and Kingship. Essay on the Architecture of the Hindus. London: Royal Asiatic Society, 1834.